Learn how to use Kanban Tool together with your favorite sites, apps and the cloud. Associate your board with Google and Outlook Calenders, One Drive, Google Drive or Dropbox. Also here - a coverage on mobile use of Kanban Tool. Kanban Tool integrates nicely with Google Drive, Dropbox, Box and OneDrive file hosting services. You can store file attachments in any of these services and access them through Kanban Tool. To enable this powerful integrations, please go to Settings - Power-Ups, and enable Dropbox, Google Drive, Box or OneDrive. You can choose as many as you are using. 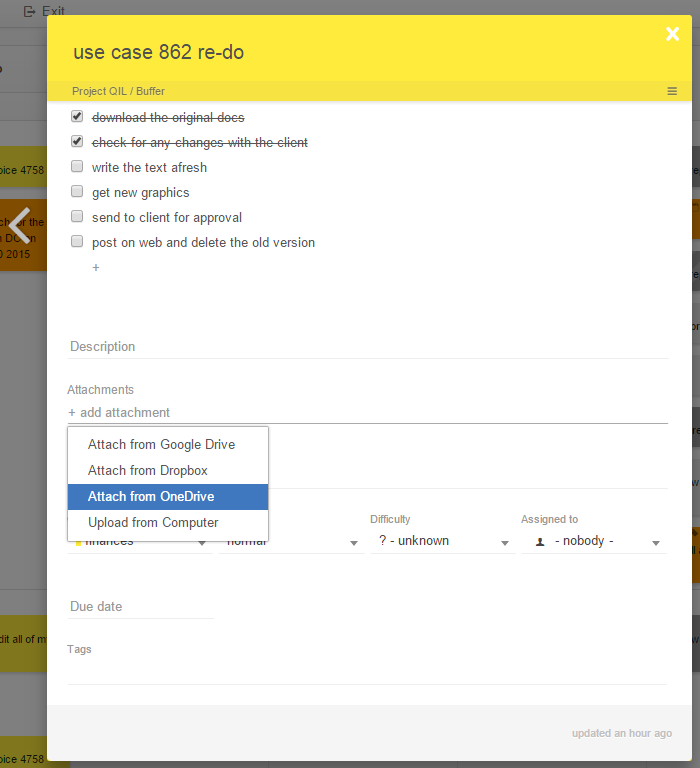 Now you will be able to add and link file attachments from your file hosting services right to Kanban Tool cards. To attach a hosting service document, simply click on the "+ add attachment" link, and choose "Attach from Google Drive / Dropbox / Box etc." from the drop-down menu. You can now add documents to your tasks and access them directly through the stored link. 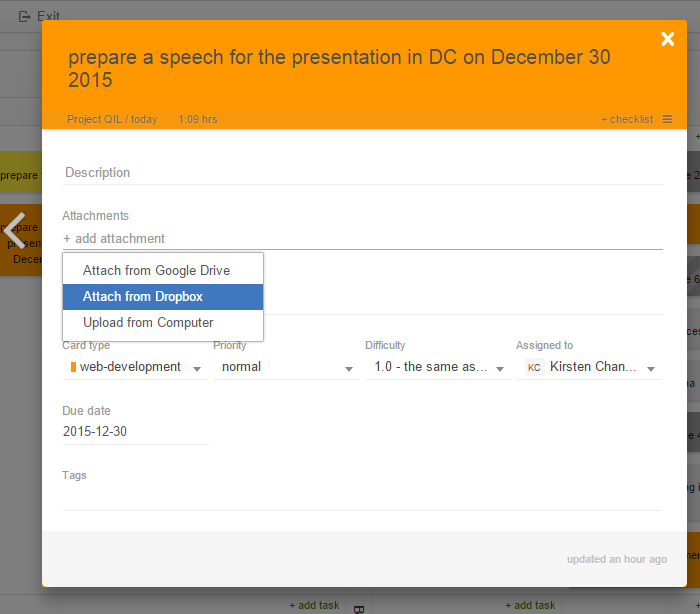 Google Drive will allow you to collaborate on your attached documents in real time. What integrations does Kanban Tool offer? Kanban Tool offers many a useful integration, and the list is constantly growing. One of the most popular ones is adding tasks to your board via e-mail (to find out how to do it, please go to next questions). We also provide a powerful API to integrate Kanban Tool with your internal systems. This integration will make it possible for you to quickly add new tasks by clicking on the extension in the browser's top right corner menu. So, no matter what you're doing online, you can always quickly add a task to Kanban Tool. Please see how to set this up right here. 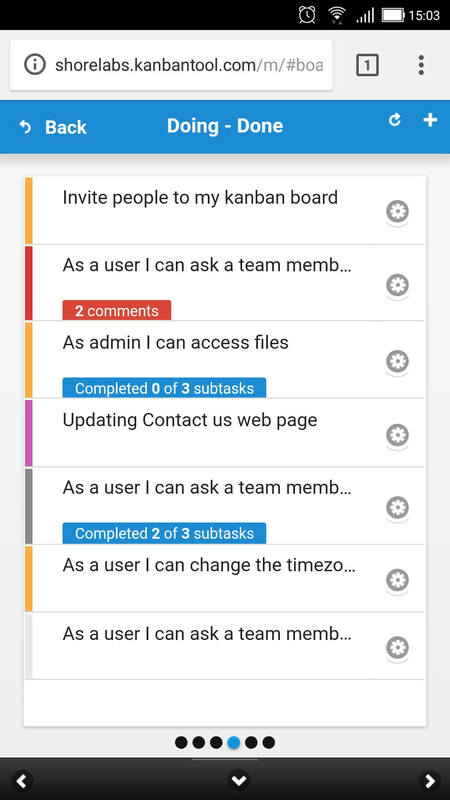 Kanbanira connects tasks in Kanban Tool with issues in Atlassian JIRA®. It's a simple, but powerful integration, allowing you to benefit from both tools. To get this going, please visit this page. This is the easiest way to sync Kanban Tool with other web services you and your team already use on a daily basis. Find out more on how to hook Kanban Tool up with any of over 200 great applications. 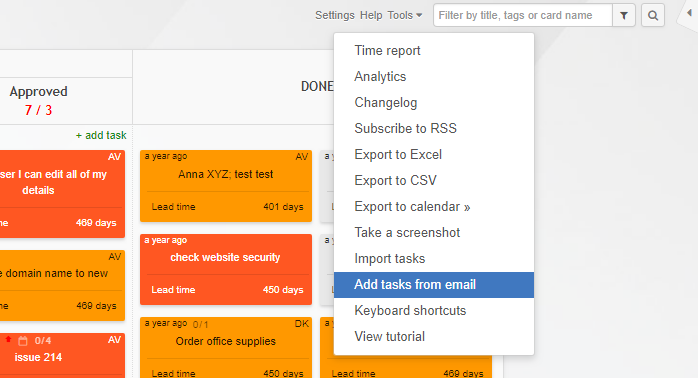 You can also create tasks in Kanban Tool and send them to Atlassian JIRA® using Zapier. Please take a look at this page to learn more. 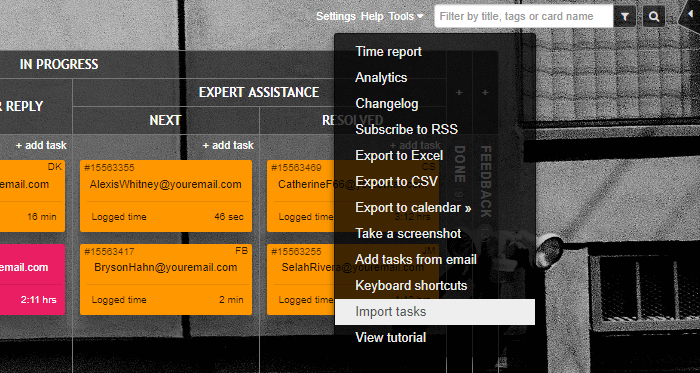 You can export all tasks from your board to Excel or CSV. While on a board, please go to the "tools+" menu in the top right corner and select to "Export to excel" or "Export to CSV" option. 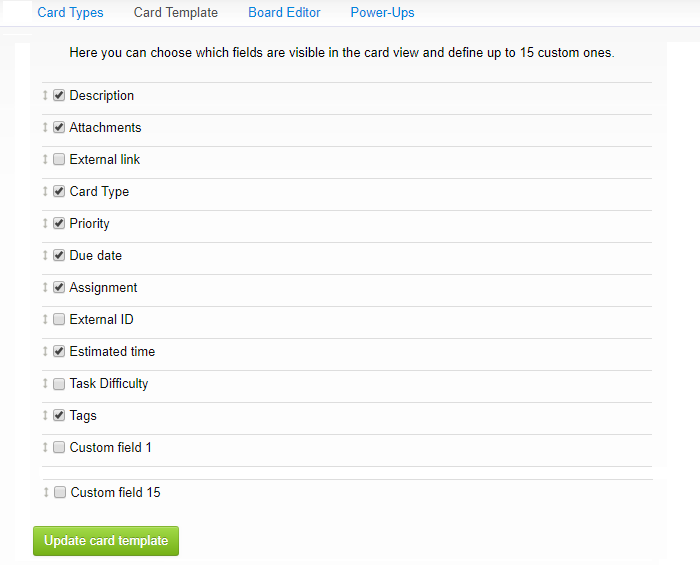 Kanban Tool allows you to import cards to your board. To do this, please go to the "tools+" menu and click to "Import tasks". Then please prepare a CSV file along with these instructions. Enjoy! While in board view, please go to the "tools" menu in top right corner, then to "export to calendar" and please select "Outlook/iCal". Important: please note, that Outlook should be your default calendar for this integration to work properly. Want to follow your Kanban Tool task due dates in Google Calendar? Make a quick export - this is all. Please note, that due to Google's synchronization settings, it may take up to 24 hrs for the tasks to appear in your Calendar. This fun integration lets you display a Kanban board on any Chromecast enabled TV to create a perfect information radiator for the team. View the detailed instructions on how to enable this right here. Get eve more out of your Kanban Tool boards by displaying them in your office with truDigital Signage device. This will further improve the communication among your team. To find out more, please visit this page. You can view the complete, detailed list of Kanban Tool Integrations on this page. In order to add tasks to your Kanban board via email, you will need to use an email address that is directly assigned to your Kanban board. To do this, please click on the “tools” menu in the top right corner next to your Kanban board and choose “add tasks from email”. Please copy the email address displayed. This is a unique address assigned to your board. Sending emails to this address will add tasks to your board. while the message itself will constitute the description of the task. Filling the subject field is required for the creation of the task on your board. Please note that you can write up to 256 signs in task name field. You can also include any type of files in the email, as regular attachments (note the size limit for 1 file being 20 MB). These will get added to the task in Kanban Tool as attachments. This makes for a great tool for better email management - you can just forward all emails to your board and work them into your workflow. You can further determine the features of the task, by adding tags to the subject of the email. The names of the tags correspond with the names on your Kanban board and determine the location of the new task added to the board. Tags should be added before the name of the task in square brackets, without spaces. - priority (high/low, normal by default). Any other attribute set in email subject within square brackets will go to the tags field. An email subject written like this will assign a yellow card to the “To do” column of the Kanban board, and the task will be named “Task 1”. A subject written like this will assign a high priority, red card, that is due on 2016-11-08 to the “Waiting” column of the “Marketing” swimlane with the name of Bill Thompson and a task name “Perform A/B tests”. How to use the “Add task button” Chrome extension in Kanban Tool? First, you need to log in to your Kanban Tool account and while on the Dashboard, please go to the "My profile" tab, then "API access". Here, please generate your API token and copy it. Then go to https://chrome.google.com/webstore/ and add this extension to Chrome. Please click in the top right corner menu of your browser to enable the Kanban Tool "Add task button". The last thing to do is to fill the form with your Kanban Tool domain name and the generated API token. 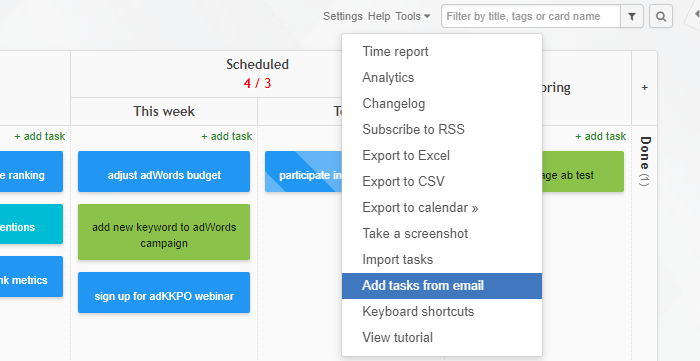 Once you've set everything up, you can be quickly adding new tasks by one click in the browser's top right corner menu. 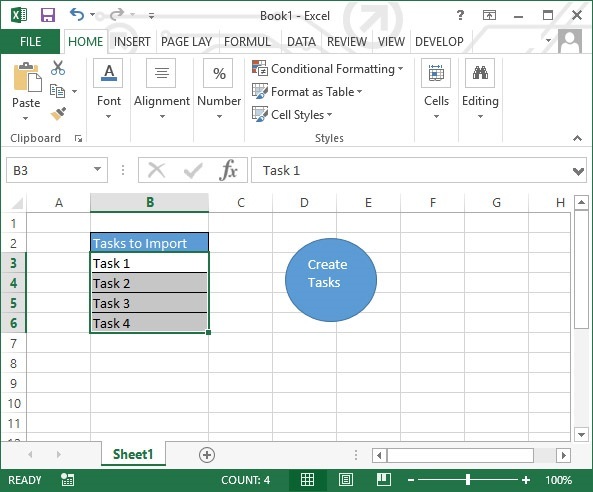 How to export tasks to Excel or CSV? 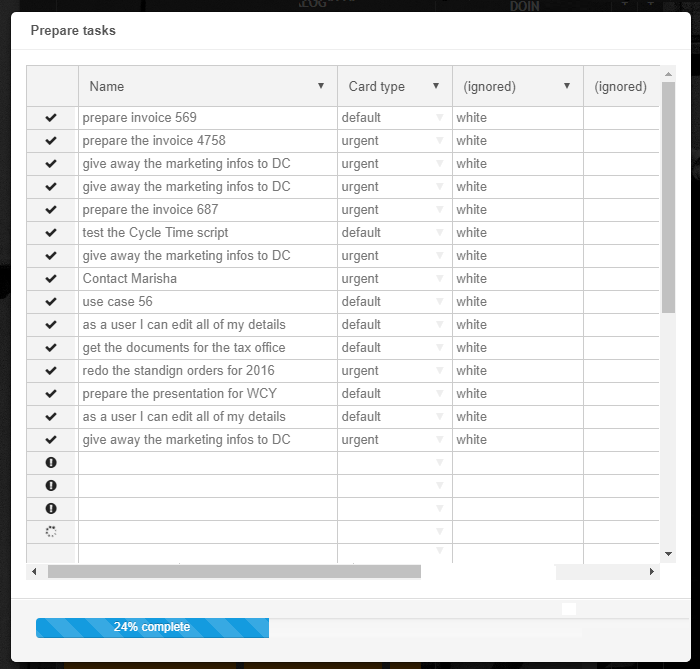 You can export all tasks from your board to an Excel or CSV file. While on a board, please go to the "tools+" menu in the top right corner and select the "Export to excel" or "Export to CSV" option. How can Kanban Tool synchronize with Outlook tasks? while on a board, please go to the "tools" menu in the top right corner, then "export to calendar" and select "Outlook / iCal". Please note, that Outlook should be your default calendar in order for this to work. 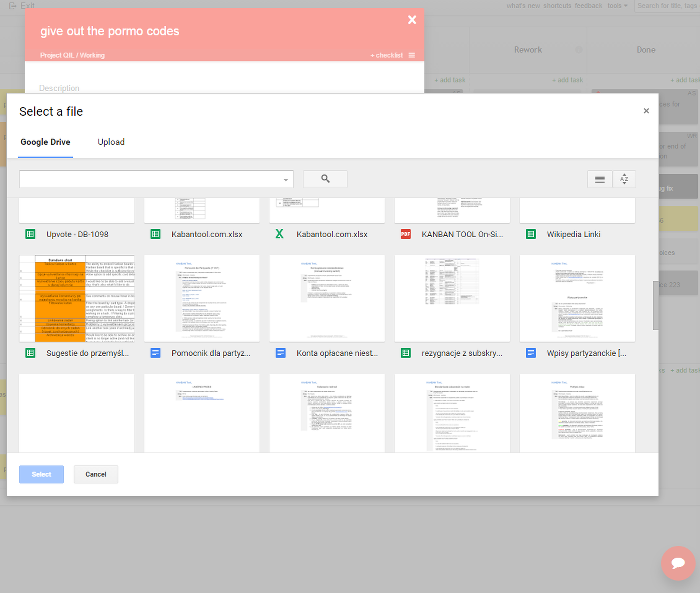 I need to export cards to Google calendar - how can I do that? In order to make this export, you'll first need to have some tasks with due dates. To enable the "Due date" field on your card, while on a board, please go to Settings (top right corner of a board view), then Card Template and tick the Due date option. 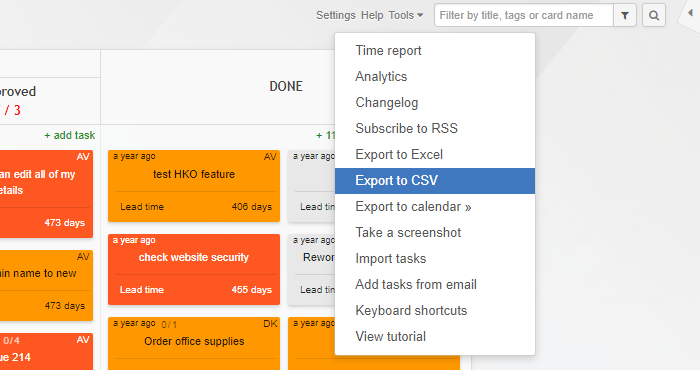 Now, once you've filled in the Due date field on your cards, you'd be ready to export your tasks to Google calendar. To do it, please go to the "tools" menu in top right corner (from a board view), then choose "export to calendar" and "Google". In your Google calendar tab you will see a box: "Do you want to add this calendar?". Please click "Yes, add this calendar". And now, your tasks with due dates will be displayed in your Google calendar. Enjoy it! Please note, that due to Google's policy of synchronisation with external calendars, it can take up to 24 hrs for the integration to be set-up. I am not able to export the Tasks to Google Task or / and Calendar. What is wrong? This problem may be caused by Google Calendar default update time for external calendars. Google updates external calendars only once a day and if you exported tasks without due dates first, then Google didn't import any tasks and it doesn't update the new ones now. Even if you unsubscribe from Kanban Tool's calendar in Google and subscribe again it doesn't help. The best option in these cases is to wait at least a day and check if you can see the tasks in Google Calendar. Do you offer an Android app for Kanban Tool? 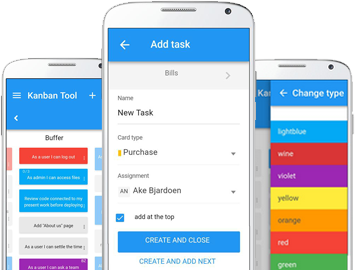 Yes, we have released a beta version of our Android app for Kanban Tool. It can be found here: Kanban Tool Android app. At the moment we are optimizing our app in terms of usability and responsiveness. If you want to share your feedback, feel free to contact us. Does Kanban Tool have an iPhone or iPad app? Indeed, a dedicated iOS application is available for free to all registered Kanban Tool users. Download it from iTunes and enjoy Kanban Tool's lightweight form from wherever you are. 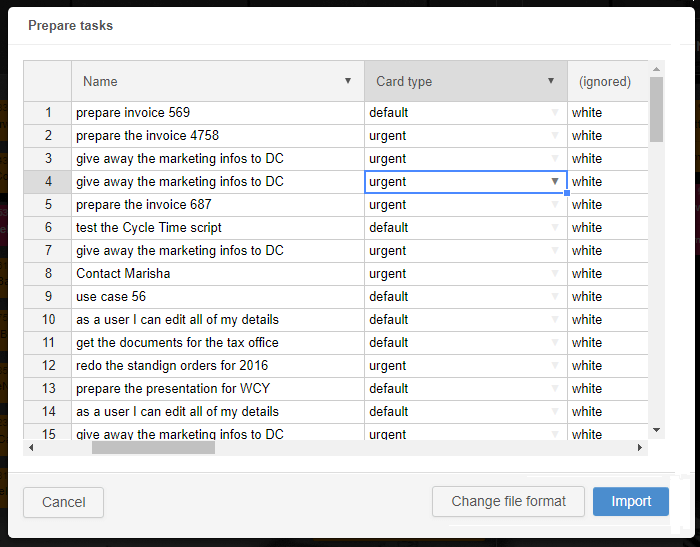 - Click and hold for a second and then drag to move a card to a different column. If we want to let a client monitor progress on a specific card what is the best way to set that up? Unfortunately, you cannot share just 1 specific card or a few cards to an external user (a person that was not invited to join your Kanban Tool account. The only solution is to add the client on, as a member of your account, but it has a downside. You will be able to provide a direct link to a specific card, but the user will also have full view of the board that the task is on. You can, however, give this user a read only access, which means they will not be able to edit any of the information, which often helps. Can I add attachments via e-mail ? Yes - in order to add attachments to the tasks that are created by email, simply include them in with the message you sending. A single attached file cannot be larger than 20 MB, but you can email more than 1 file at a time. Enjoy! Not sure how to create tasks by email - please visit this page. How to enable OneDrive (SkyDrive) Integration? You can easily add files from your OneDrive account and collaborate on them in real time in Kanban Tool. To start using this integration, please go to Settings - Power-Ups, click on OneDrive and press the Enable button. Ready! Now you can attach files directly from your OneDrive account. To attach files from OneDrive, please simply press the + add attachment link from an opened card. Choose Attach from OneDrive from the drop-down menu and take advantage of the new possibilities. The OneDrive and Kanban Tool integration helps you keep documents and tasks together, all in one place. Always at hand, available no matter where you are! Get important email alerts on your board! Stay on top of all new notifications and visualize the alerts on your project boards. You can integrate email alerts from any software you are using. You can integrate MOZ alerts with Kanban Tool and stay up to date with all the notifications. Our Marketing board template is designed for the alerts to be stored in the very first column. 1. First, obtain your board's email address from Tools - Add tasks from email by right-clicking on it and copying it to the clipboard. 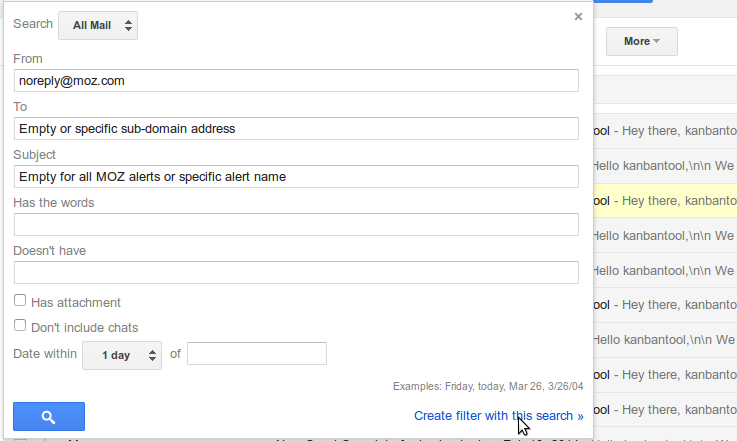 In order to start receiving your alerts to the board you will have to setup filters in your email account. 2. The first step is to go to Settings - Forwarding and POP/IMAP and click the "Add a forwarding address" button. Then paste in the board's email address that you've copied a moment ago. Once you've confirmed the address, a new Kanban card will be created on your board with instructions to activate your new forwarding address. Follow the instructions inside the card to verify your email address. You have verified the forwarding address. then select one of the emails and click „More” on the toolbar and then „Create filter”. Open any email from MOZ that you want to forward to your Kanban Tool board. Then click „More” on the toolbar and „Create filter”. 4. Now you will have to specify the alerts you want to receive. All alert emails will be received from the same email address so we leave it as it is. The „To” field can be used if more than one sub-domain is used within one email account. Leave it blank or type in a specific email address for your case. The „Subject” field will allow you to set the filters for specific alerts or by leaving it empty you will receive all MOZ alerts. 5. Once you have filled out the information please proceed to „Create filter with this search”. In this section you will have to specify your filter options in order to forward the alerts to your project boards. Since the alerts will be visible in Kanban Tool, you can check the „Skip the inbox (Archive it)” box to avoid unnecessary traffic in your inbox. Also, please check the „Never send it to Spam” box. Most importantly, do check the „Forward it to” box and select your board email address that the alerts will be forwarded to. 6. Congratulations, now you will receive all alerts directly to your project board. We advise on setting up your board according to our template where the first column is an „Alert” lane, in which all the alerts will land. Please feel free to download Kanban Tool dedicated applications for Android and iOS mobile devices. You can also use a mobile gateway for mobile devices so that you can easily manage your tasks on any phone or tablet. The mobile version can be opened by simply adding /m at the end of your domain's URL. 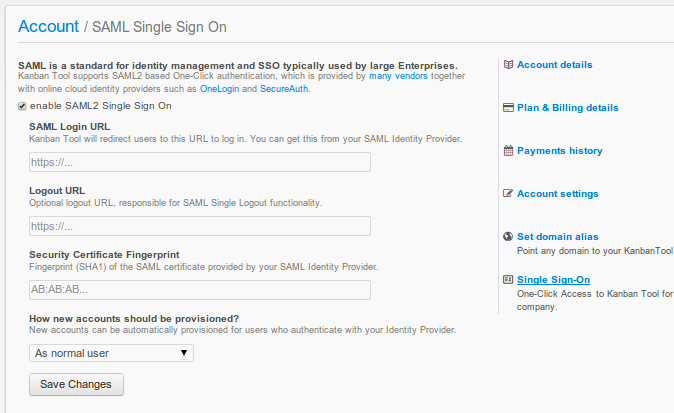 SAML is a standard for identity management and SSO typically used by large enterprises. Kanban Tool supports SAML 2.0-based One-Click authentication, which is supplied by many vendors together with online cloud identity providers such as OneLogin and SecureAuth. Kanban Tool's integration with SAML 2.0 will allow all your team members to log in to Kanban Tool with just one click. Also creating new accounts is much simpler - just add a new person's profile to the identity provider's service. Similarly, when someone leaves your company, you'll be able to delete their profile with a single modification. To enable it for your team - you will first need to have an account with one of the identity providers (an example: OneLogin, SecureAuth). Then, from a Kanban Tool's Owner Account, please go to the Account Administration panel, then Single Sign-On and please tick "enable SAML2 Single Sign On". Here you will need to fill in the information provided by the identity provider's service. From here your team is all set! 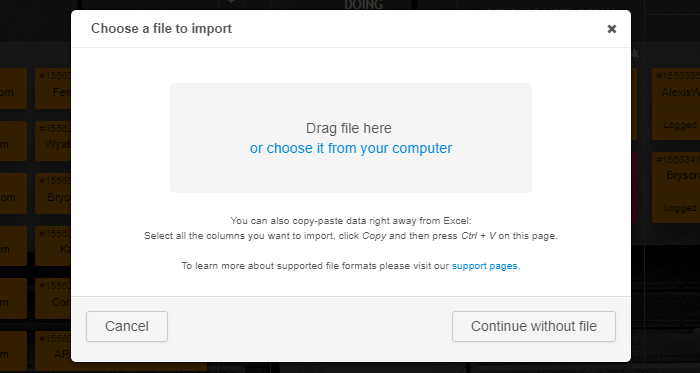 How to set up an Excel file for import? You're welcome to import a number of tasks to your board in one go - either by uploading an Excel / .csv spreadsheet, or by dragging a copy of data directly from an Excel sheet to the import window, or by typing task data into Kanban Tool's import table. If you're going to import a file, which contains a title row, naming what data type is listed in which columns, you should either delete this row before uploading, or use the built-in import option to change file format where you can select to ignore the first row. If the imported file seems to have incorrectly detected your data separators, you may also tweak this in here. Once you've got the first row removed and data separators in order, it's time to assign which card fields are represented by which column. On many occasions, Kanban Tool will recognize some fields itself, especially if you're using a Kanban Tool export file to import back. If your file has any empty columns, or columns you do not want or can't import back to Kanban Tool, leave the heading above this row as (ignored). For all other columns, be sure to choose the right data type field from the drop-down list. In cases where you need to choose an option defined by the board settings, such as a card type - you can do this by hovering over the field - an arrow will show and let you choose the right type from a drop-down menu. This will happen for various field types - whenever you see this arrow, it means that cues are available for you to choose from. After this, simply hit the blue Import button at the bottom. If there are any problems with the import, you'll see a black exclamation point - if you hover the mouse cursor over it, you'll see information about what exactly was the problem. 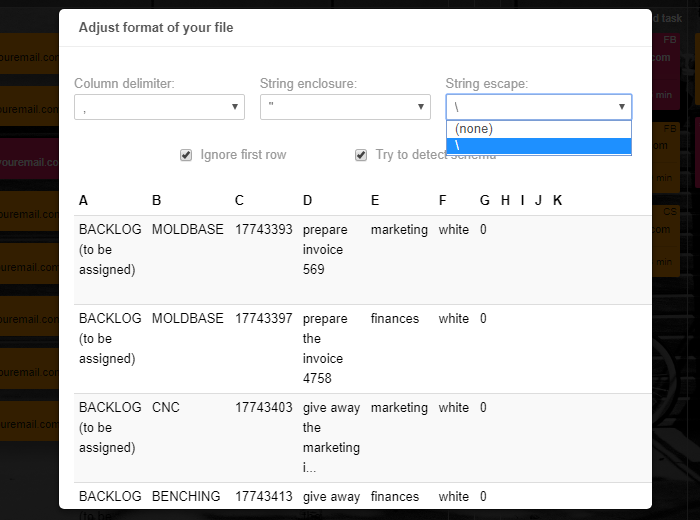 The import functionality also allows to make updates to tasks that already exist on your board. To do that, please be sure to include either native IDs or External IDs of existing tasks on the import list - the data you import for a task of that ID / External ID will overwrite what was there previously. It's a great way to mass update task due dates, user assignments, priorities or tags. For as long as either an ID or External ID is named, you can synchronise tasks with an Excel sheet with no limits. Get one-click access to Kanban Tool for your team with Google Apps for Work: find out how to give all of your Google team members access to Kanban Tool with SAML 2.0. If you're using Google Apps for Work (company email addresses with Gmail, Company Google Drive etc. ), this is the best way to make Kanban Tool your project management go-to place in your Google Apps. SAML 2.0 is a standard for exchanging authentication and authorization data between security domains. Use this integration to make the 2 come together and simplify your team management. 7. In Kanban Tool's section on How should the new accounts be provisioned - please choose what user privileges should the newly SSO-added users of Kanban Tool have - if you'd like for them to be able to create own boards, they would need to be Project Managers. If you leave them as normal users - they will only see the boards that others will share with them. Please note, that when choosing the option to "not provision new accounts" - you will need to change the account creating user's username to their email, otherwise they will not be recognized when signing in with SAML 2.0. In case of any questions at all, please contact support@shorelabs.com. If you're interested in integrating Kanban Tool SAML SSO with ADFS, please contact us to get a detailed guide helping to achieve this. If you often work in Microsoft Excel's spreadsheets, and want to integrate your Kanban board with Excel data - you may wish to simply create tasks on a Kanban board directly from the Excel data cells. Follow the clearly explained steps to add a custom macro to your spreadsheet, and you will be adding tasks to Kanban Tool from Excel in no time! Where do I get my API token? Each user has a unique API token. To generate yours, please go to My Profile - API access. My Profile is available under your name displayed in the top right corner of the dashboard view (all boards). To learn more about using Kanban Tool API, please visit this page.